After all the wonderful bread that Kristin’s been making, I thought I’d look into trying to make my own sourdough. I’m pretty sure this way lies madness. But I’m giving it a shot. 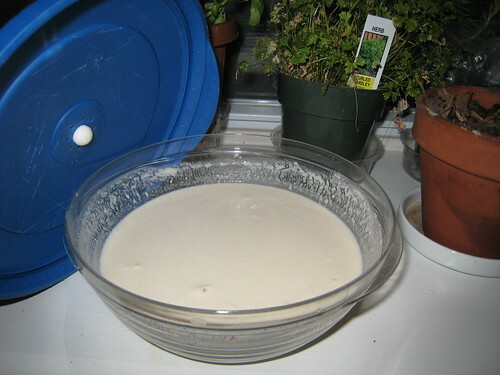 After Googling for info on making sourdough (the ultimate DIY bread) I just mixed together 1 cup water with 1 cup flour in a bowl, and we’ll see where we go from here. This entry was posted on Tuesday, September 18th, 2007 at 11:24 pm	and is filed under Food, Pictures. You can follow any responses to this entry through the RSS 2.0 feed. You can leave a response, or trackback from your own site. I’m a starter virgin (ha!) and just found this guy’s site the other day. I’m learning soooo much from him. So far, so good! How did this turn out? I was thinking of doing a St Louis Sourdough because I’m curious how our regional microfauna tastes. It turned out pretty good. I ended up making bread a couple of times, but then eventually because I didn’t keep on following the right process of feeding it regularly it ended up going bad and I had to throw it away. The flavor was good though. Forgive me, but what do you mean by “feeding it?” I must be missing something here. Feeding it means adding more water and flour every day. You pour out some of the starter, then add more ingredients to “feed” it. When i was a little boy my mom had me making her bread. Sometimes we made sourdough. Glad tohear someone’s still doing it cuz sourdough is delicious!